The top end medical coverage market in Shanghai has been boosted with the news that Raffles medical have broken ground on a new custom-build hospital in the Qiantan development area. The new facility will have 400 beds and covers 12,000 square meters, and according to Raffles group, will specialize in cardiology, obstetrics and gynecology and oncology and orthopedics. Specialist staff will all receive training at Raffles base in Singapore before being posted to Shanghai, the group announced at a groundbreaking ceremony attended by local dignitaries including the deputy head of the city’s Pudong district – the largest and most economically powerful sub-division of the city. The hospital’s location, in Qiantan, also known as “Shanghai New Bund” is noteworthy. The area, located in south west Shanghai near the former Expo 2010 site, has been earmarked for development as a major new centre by the city government. 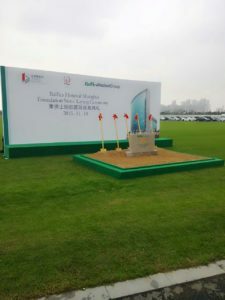 It is being marketed as the “New Lujiazui” – a reference to the area of the city where Shanghai’s iconic super tall skyscraper skyline is located. Raffles didn’t release firm dates on the hospital’s completion schedule, but according to the Shanghai Daily, the whole area will be complete by 2020 and will feature malls, office tower blocks and international schools. Currently, the site has roads and other surface infrastructure in place, and the developers say there will be residential space built here for up to 25,000 people. However apart from the Oriental Sports Centre, and a few office buildings, full scale work on the site has yet to be begin and the area is sparse and devoid of much activity. However, this area is not near any of Shanghai’s expat hotspots and the siting of a top-end hospital here is perhaps an indication of where Raffles see their future market – China’s growing middle class who are demanding and increasingly better able to afford international-standard healthcare. The area is currently served by three subway lines, including a direct line to Xujiahui, a major commercial and residential part of downtown Shanghai. Clearly Shanghai hopes for it’s New Bund development area can revitalize an area of the city which has lain dormant since the Expo 2010 and Raffles breaking ground on a new hospital in this area gives a strong indication of the direction the premium healthcare market in China is heading in.